BABY BLUE! BABY BLUE! I must admit when I saw this jumper I thought my girls would be too big to stay inside, BUT when it came home to momma the girls (my breast) and I were ecstatic. The fit hugged and snugged them well. The romper is a size 2X. The top is held by a strong elastic that holds and secures the breast area from any spillage. The weather couldn’t have been better! 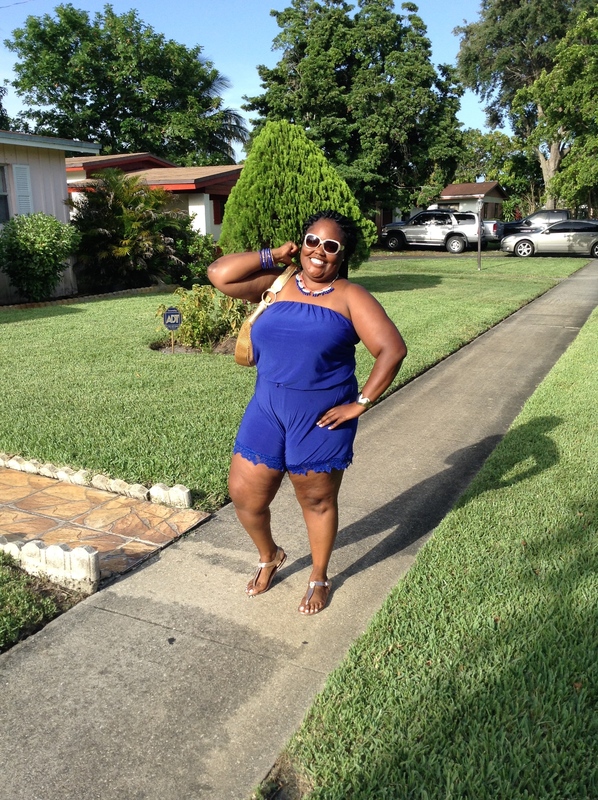 The sun was bright and made the ocean blue romper POP and had every eye looking and wondering where did she get this outfit from! The design on the bottom gives the romper a flare look adding edge to the romper. This romper can be worn on a date with your “boo” or a day out with the girls. No matter where you are, this romper is a conversation piece and would keep a smile on your face for making such a great choice on purchasing this outfit! So, tell me about your romper! I need to know what kind of bra you have because I never wear strapless because I’m always worried about “the girls”. You look fabulous. Thank you so much…the bra am wearing is from Ashley Stewart…it is a little old not sure if they have anymore like this style, but you can go to Sears and/or research special boutiques in the area that customize in bras….may be on the high end but perky will out do saggy…hope this helps!